Do not take your decision to purchase Iraqi Dinar lightly. Thinking about joining up with thousands of others and purchasing IQD? Before you make your purchase you need to understand where to buy it, how much it should cost you, and how to avoid the many scams out there. 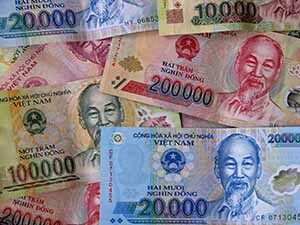 By reading this article you will know how to buy Iraqi Dinar. If you are asking yourself, “Should I buy?” you will know before the end of this article. Some people are searching for buy dinar scam and they are finding this article, which is great because I want everyone to be informed. If you are trying to decide where to buy dinar, there are only two places I would purchase Iraqi Dinars from, eBay (because of free market opportunity) and online (if you can find a cheap price). Read my article on Planet Dinar. I made a press release on the Iraqi Dinar in March of 2015. Many people, including each and every guru, failed to notice that the C.B.I. was planning to make the announcement that they were removing the 50 Iraqi Dinar banknote from circulation on April 30, 2015. I helped countless dinar holders to exchange their lower denom 50 notes into larger notes. Some dinarians actually used the exchange to buy gold and silver, as I have been advising for months. As for buying dinar online, shopping around will help you to buy IQD cheap. Check your order status often until you receive it, especially if you purchase from eBay, and don’t tell everyone in town your information about how rich you will get. Not only will you look dumb, but people will start arguing with you. Keep quiet, pretend like you are the only one who is going to make money, it’s better that way, otherwise, you will get opposition. Best to keep your investments to yourself unless it involves your spouse. The honest truth is that no reputable investors (Gerald Celente, Peter Schiff, Willem Middelkoop or Hugo Salinas Price) even mention this as an investment. The more time goes by, the more it seems that the Iraqi Dinar is a bad investment, but does it have any potential? If you are still interested in investing, then it’s important that you check out the CBI (Central Bank of Iraq) website and not only check their increasing money supply, but check out the live exchange prices and also the currency auction results. The Central Bank of Iraq posts currency auction results often, and the rates are live on that site. There has been a fixed exchange rate since about 2010, so don’t expect huge returns on your investment anytime soon. 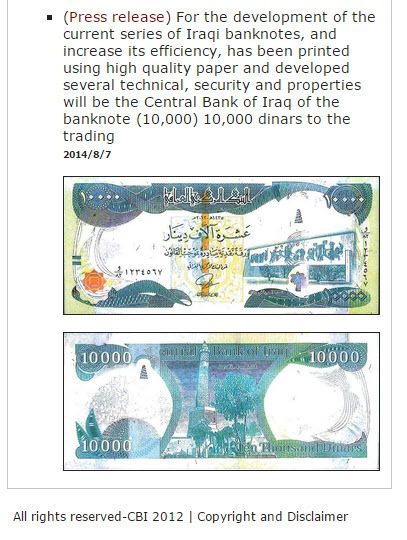 Make sure you know about the new Iraqi Dinar banknotes. First off, there is the great free market opportunity for sellers on eBay. Some are from the US, some are from South Korea, and some live in Canada. The Iraqi Dinar sellers on eBay want to make money, so it is in their best interest to keep the lowest, most competitive prices. On most of the Iraqi Dinar calls, you will mostly hear company names, mainly because the host is promoting the company. Buy dinars at your own risk, if you have watched my video on Dinar Guru TNT Tony then you know. As for that Iraqi Dinar company, I do NOT endorse any dinar companies. In addition, if you notice, I NEVER recommend any Iraqi Dinar companies, I believe in free market opportunities, so please check out eBay and to a lesser degree Amazon.com for the best prices. Always check feedback ratings before you buy. The good things about eBay and Amazon is that it takes quite some time for the dealers to update their prices, so you might be able to get a better deal if you buy from them. Again, I am not buying IQD and I don’t recommend it at this time. If you want to buy IQD with Credit Card eBay and Amazon offer this. You can’t do this at a bank because it’s considered a cash advance, and you can’t do that on most other dinar dealers online. Dealers prefer to have direct funds without all of the transaction fees, paying for your Iraqi dinars with a credit card means extra merchant fees for them. As a result of these high fees, the dealers prefer digital checks, or direct deposit (your checking into their business account) this is another reason why I recommend Amazon and eBay as your best options. You can use PayPal when you buy through eBay, so that way, a credit card can be used. For our ordering process (which I consider a scam) you will be reserving in a secure way a total of a million IQD for every 100k IQD you order. (wow what a deal! let’s keep reading) Your order will arrive in four 25k notes (Iraqi Dinar Banknotes) totaling 100k IQD, again this is for EACH quantity you order and it be will sent right after we get the receipt of your payment. You will be Securely Reserving a 30 day right to purchase ONE Million IQD for each amount or quantity that you entered, regardless whether or not there is a rate change of the IQD. (now here is where I really have trouble believing) If you decide to exercise your right to purchase a million IQD at the set rate of $1,000 within the 30 day time period, your million (or whatever quantity you order) will be shipped out immediately following payment. OK, so what I have gathered is that you purchase dinars, but you also get the option to purchase an additional million within a one month (30 day) window. So if the dinar revalues 12 days after you place your order, you will not only have your 100k but you will have the ability to order another million for another $1,000 within the following 18 days. If the dinar revalues at a penny, then you will be holding onto $100,000 worth of dinar that you only have to pay $1,000 for. Sign me up! That was a joke by the way, the problem I have with this is the fact that most of these dinar people really don’t have the reserves they claim they do. Quite recently, people who tried to buy IQD found out that they couldn’t get specific notes that they ordered. How does a company like this make such a huge error? Some of you still don’t believe me when I tell you that Tony has admitted he works for some dinar company, see the link above to the audio clip I posted back in 2014. As far as I know, this scam (overcharging for Iraqi Dinar) is not limited to the US and is common in currencies other than the US Dollar, be careful. The other problem is that when the dinar doesn’t revalue, which it hasn’t since 1990, then you lose your option and your investment into the option. Now, 100,000 dinar should only cost you $85 but with this dinar option added on you end up paying around $130-$150. Think about that, you are paying 50% to 75% more (called a premium) and getting NOTHING but a promise that they don’t have to even keep. The Iraqi Central Bank, also known as the CBI or Central Bank Iraq, can change their currency at any time, so make sure you bookmark that link above. The picture below shows the New Iraqi Dinar, make sure you buy the new currency, not the old Saddam notes. 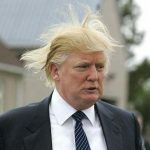 The reason they don’t have to keep their promise is because they can simply file for bankruptcy, then afterwards they transfer their assets offshore, or they can forgo bankruptcy altogether and just transfer their assets to the Cayman Islands (which many of the richest people in the world do) and their money can’t be touched. Another example is they take their money, withdrawal physical cash from a bank in the U.S., buy gold or silver locally with the cash (no paper trail) and store it in a vault somewhere. 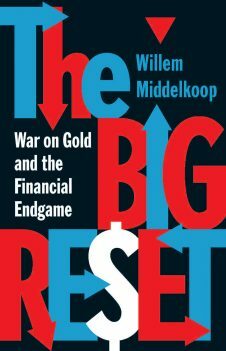 When the IRS finally catches up to them, they assess what he or she’s business is worth, however, since their real wealth (gold and silver) is stored elsewhere the bankruptcy proceeds without those assets listed. If you were wondering did Donald Trump buy Iraq dinars, unfortunately, I see no evidence. Let’s assume they have an L.L.C., they go bankrupt (meaning their business has more liability then assets) but still keep some of their personal non-business money in their private (non business) account. You lose your extra investment for the option purchase, or premium as it’s called, and now they get to live on the Cayman islands, where they are NOT subject to US law or Repatriation. With the amount of money they have, they don’t need to come back to the USA or Canada or wherever they are from to stand trial, oh no, they are gone, for good! There are some people on eBay and elsewhere that are selling these options or reserves and are making a fortune! They sell you no physical of dinar but offer millions of dinar in options, in some cases, five or ten million in options! So you pay $200 and they get to keep your money, they do this multiple times PER WEEK! I calculated one eBay seller who has been selling these options. He is selling these 90 day options and if you add up all of the auctions he would have to have over 150 million dinars, but he doesn’t sell any PHYSICAL dinar. I contacted him, if you watch the video I posted below you will see and hear what transpired. Just as a followup, as of today, eBay user kevimos, who I contacted about his fake options, is no longer a registered user. You can still see his auctions from the past. What will be your future if you purchase IQD today? It’s anyone’s guess, but when Iraq get’s their running water and electricity, this country will be one of the best investments you can make. I have already made my decision to invest today. 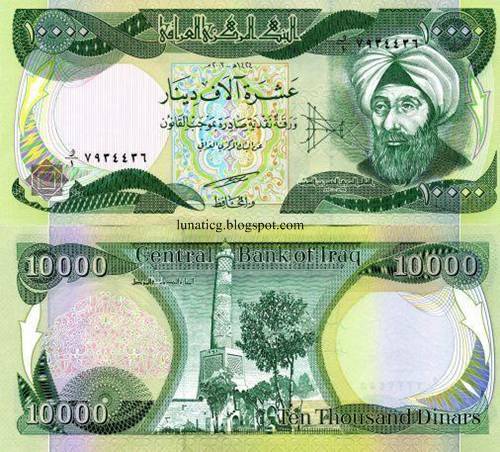 Learn more about the history of the Iraqi Dinar here before you buy dinars. If you are expecting the revaluation of the Iraqi Dinar then make sure you buy a little bit of dinar, you can search online, but make sure you find the best price. Some people are still asking the question, “Should I buy Dinars?” In my opinion, yes, but only buy what you can afford to lose. For some of you, that might mean only one single 25,000 dinar (25k) note, but for others, you might be buying a million dinars or more. Remember, there are lots of people who buy and sell Iraqi dinar, make sure you investigate first. If something goes wrong you won’t be out $20,000, and if something goes right you might receive double your investment or more. People you should know about, Andrew Reed, John Galloway, Mike Rothschild, and Bella Batalli. Do some research on these people, and what they have to say about the dinar. It’s good to have a difference of opinion. I start to become concerned if everyone is saying the same thing. Some have said that the Iraqi Dinar will RV (revalue) because the Kuwaiti Dinar revalued. What is often misunderstood is that when Saddam entered Kuwait around 1990 that the government of Kuwait decided to null the stolen dinars and to reduce the exchange rate by their own choice. Nobody got rich, regardless of what you have heard, just like Saddam had artificially kept the dinar at 1 IQD = $0.33 USD the Kuwaiti government also artificially lowered the exchange rate of their currency, even if just for a short time. The day will come when you can buy your Dinars from bank, yes, I know, hard to believe, but a few years ago, you could buy IQD from Chase bank. That is not a mistake you actually could really buy Dinar, I have an acquaintance who did so. Hopefully, the next time I go to the bank with my dinar it will be for the dinar currency exchange, I want this reset to happen as soon as anyone else, I just wish we didn’t have to wait so long. I am not planning on getting rich off of this, I just want to get rid of this currency as soon as possible. Now, you are asking yourself, should I buy IQD? That’s entirely up to you, I’m not a financial adviser. I’ve tried to tell you how to go about purchasing dinar. I hope this article assisted you. Make sure you check out out the breaking news page I created.Please share this article, it might help someone you know learn how to safely and properly buy the Iraqi Dinar currency. are these bills part of RV or does it need to be the older $25000 bill? ?